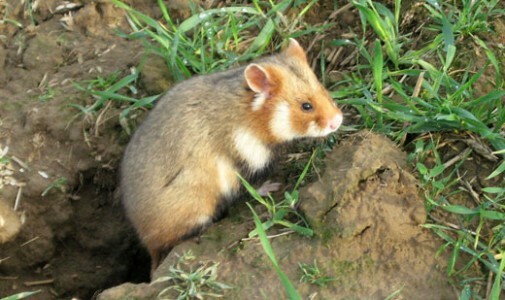 In the wild hamsters spend most of their time digging and searching for food. Syrian hamsters are the largest species of hamster, growing up to 30 cm in length. Roborovski hamsters are the smallest. Hamsters are solitary animals. They are extremely territorial and can become very violent if another hamster comes into their territory. Most hamster species are fast runners. The shape and size of their hind feet allow many of them to run backwards as quickly as they run forwards. This is vitally important in allowing them to escape in their burrows when threatened. Hamster burrows include an array of tunnels and chambers, with separate areas for eating and sleeping, just like human houses. Some are up to a metre deep. Unlike most animals, hamsters have a full set of teeth when they are born. They keep this original set for their entire life. The name ‘hamster’ comes from the German word ‘hamstern’ which is associated with storing food. Hamsters can carry their own bodyweight in food in their cheek pouches. They store food in their pouches when out foraging to stash later. They keep secret stashes of food so that they are prepared for any period when there is a lack of food availability. Hamsters are nocturnal, being most active during the night. Hamsters can recall their family members, even if they have been separated for years. Although not true hibernators, in the wild hamsters will stay in their burrows and block up the exits with soil. They sleep in grass-lined nests, and wake up once a week to eat some of the food they have stashed over autumn. In the case of the Golden hamster, while “hibernating” their pulse drops from the normal 400 beats per minute to only 4 per minute! They only take a breath twice a minute.